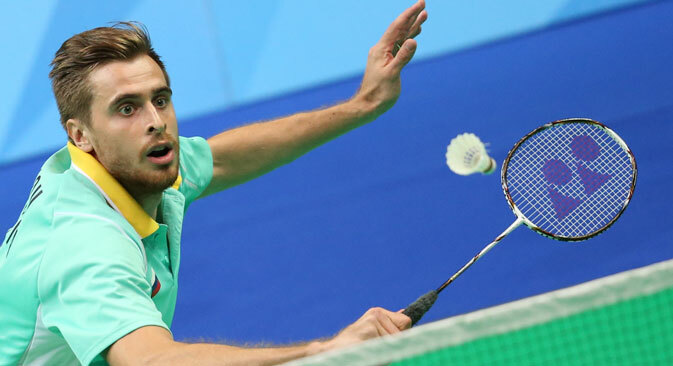 The Russian duo of Vladimir Ivanov and Ivan Sozonov won bronze at the India Open-2015 badminton tournament, after they lost a 50-minute semi-final game to China in the doubles contest last week. Russia’s badminton team captain Vladimir Ivanov spoke to RIR about his impressions of the tournament, what made him fall in love with India, as well as about the team’s plans for the 2016 Olympic Games in Brazil. How do you rate the level of organization of India Open-2015? Very good. Courts. Sponsors. All top level. Will you participate in the following India Badminton League (IBL)? I was invited to play for the Mumbai Masters again. I agreed. Will your partner Ivan Sozonov go too? Will you play together? We don't know yet. Ivan will participate in the auction, during which the teams select their players. The date of the auction has not been set yet. As far as I know, it is being decided now. What do you think about the Indian badminton school? Very strong Singles. Good coaches. Which Indian athlete's playing style do you like? Kidambi Srikanth is more active, aggressive, with good sense of the net. He is a volatile player. What are your expectations for the upcoming World Cup and the Olympics? Medals, of course. Ivan Sozonov and I have already beaten all the top ten teams in doubles. As of today, I may say, the whole team is supporting us, since primarily, it is the two of us who bring results. Who do you consider your main competitors at the Olympics? Basically, all the top ten teams. In the doubles category everyone plays quite steadily and deserves to win -- the Danes, the Chinese and the Koreans. Have you been to Brazil yet? How is the infrastructure? Not yet. We plan a trip there in December. We will participate in the tournament at the same arena where later we will play in the Olympics. It is important to understand the acclimatization process, because it is a whole different continent, after all. You mentioned the need to involve a foreign coach. Have you asked for one? Many of the best coaches in the world want to work with us. I hope that before the Olympics we will have a chance to work with someone of them. The coach would act as a team consultant, and that would be enough. Physically, we can do everything, now we need an emotional boost which can be provided with the help of a foreign coach. I get the impression that you come to India more often than to other countries. Is that so? It happens to be so. Actually India hosts four major tournaments per year. Most countries host one or two. Badminton is developing very actively in India. Which cities have you been here to? Six cities, so I basically I have seen everything there is to see. But I haven't been to Agra yet. My favourite city is New Delhi. Firstly, it's home to one of the best friends of our team - Igor Kislov, abadminton player himself. Besides, many of the Russian Embassy in India actively support us; go to matches, cheer for us. For the level of infrastructure, though, I prefer Bangalore. Is Indian food not too spicy? Indian food is one of my favourites, along with the Uzbek, Armenian, Middle Eastern and Chinese food. I love spicy. It's my kind of food. You have probably been asked this many times. Where do you see yourself in 10 years? I will be a good family man. My wife is pregnant now. I consider myself a good husband. I haven't thought about coaching yet. I have not tried it yet and do not want to. Time will tell.